I have some pretty strong evidence that the Steam keys from the defunct IndieGameStand are being re-sold. 3 Nov 2017, 10:24 p.m.
tl;dr: Developers, revoke the Steam keys you supplied to Indie Game Stand! I'm the developer of a game called Airships: Conquer the Skies. It can be bought through a bunch of platforms, including Steam, and, until it shut down earlier this year, Indie Game Stand. I supplied IGS with builds of the game and a set of 500 Steam keys to give to buyers with their purchase, which is pretty standard practice. I've done the same with itch.io and the Humble Store. On June 6 this year, the Indie Game Stand home page was replaced by a short message stating they were undergoing server migration and would be back soon. Instead, on July 25, the site went dark entirely. I didn't receive any messages from IGS about any of this, nor did they send me the (admittedly small amount of) money they owed me for sales. I just kind of sighed and thought, "well, that's a shame". It did cross my mind that they had not sold the vast majority of the 500 keys I gave them, but with their site down, there was no way for me to reliably tell which of the keys they had sold. I could have revoked the keys through Steam's systems, but I didn't want to punish people who had bought my game! Over the past few weeks, I have noticed an uptick in the number of Steam key activations for Airships, without a corresponding increase in sales through itch.io or Humble Store. I had a look and found that Kinguin did indeed have keys for my game in stock. I don't do large-scale giveaways, I don't do bundles, I don't do big sales, so where were those keys coming from? Of course, a regular buyer might decide that the download link they got was good enough for them, and that they could sell on the key, but why was this happening so much more now? 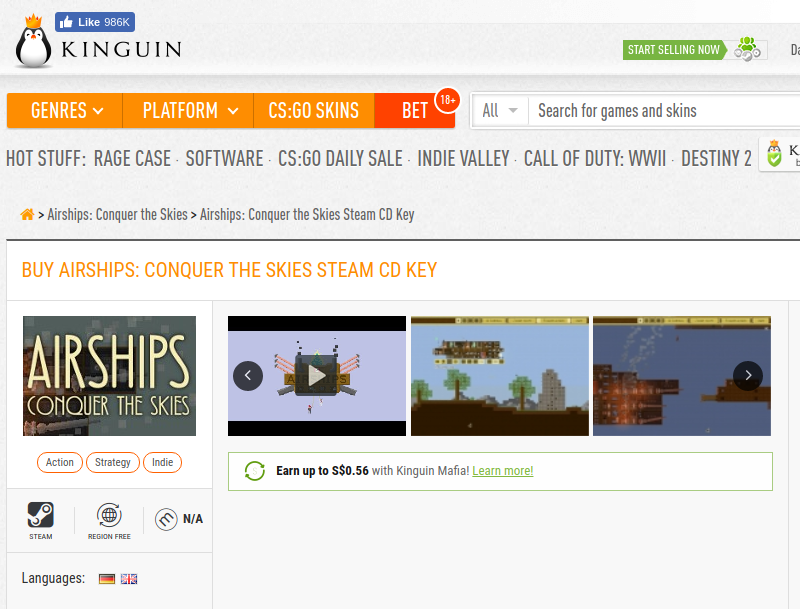 So earlier today, I gave in and forked over some money to Kinguin for a key of my own game. Now, of course I keep records of what keys go where. And yes, indeed, it was an IndieGameStand key. With the help of my partner, I then went and checked my list of every single key supplied to IGS up to that one to see if it had been activated on Steam, meaning that it had been bought. The first 92 keys had, with a few exceptions, been activated between February 25, 2015, when the game first became available on Steam, and August 31, 2017. Only six of those had been activated in 2017 at all. Then, there was a gap of 103 keys that had not been activated. Finally, there was a new group of seven activated keys, starting October 8, 2017, with the most recent one on November 2, 2017. I think it's highly unlikely that 103 people bought but then didn't activate the keys, followed by seven of them all activating their bought keys within a month, a long time after IGS had folded. So, in conclusion, I believe that the keys I supplied to IGS have fallen into the wrong hands, and that this person is now selling them through Kinguin. I have now revoked all of the unused keys I supplied to IGS. I'm also looking into taking further action. It's pretty likely that if this happened to my keys, it's happened to all the keys supplied to IGS. I mean, why stop at one game? So if you're a developer who supplied Steam keys to IGS, I urge you to revoke them now. And get in touch with me so we can figure out how widespread the damage is, and what we can do about it. IGS did not pay me for the keys. They do not own them, and hence have no right to re-sell them. The way this works, with IGS, and also with itch.io and Humble: The developer supplies the keys to the website. The website sells the keys, and pays out the developer as the keys get sold. I did not revoke any already activated keys. No one got their copy of the game taken away from them, not even people who bought the stolen keys from Kinguin. gp4 Nov 2017, 5:11 p.m.Saw this on reddit today and decided it was a good time to activate any unused keys I had on IGS. (I keep meticulous records of my keys in case a site goes down like IGS did.) I had five keys that I hadn't used yet, each for a different game purchased from IGS. I activated them all on a secondary Steam account, and they all activated fine. Please be careful with your "Developers, revoke the Steam keys you supplied to Indie Game Stand!" wording. If the devs of those games had followed suit, it would have prevented me from activating those legitimately-purchased games. I'm wondering if IGS sold off *unsold* keys from the batch you sent them. If so, and devs keep good records as it seems you did, and keys sold on IGS were assigned to purchasers in order instead of randomly, then I can go along with revoking any keys sent to IGS beyond the number that were purchased on IGS, and a notice from the dev that such action was occurring and if any legit purchasers are unintentionally affected to send any proof of their purchases (if they still have their keys after IGS went down, they probably have proof of their purchase). Also, thanks for the heads-up -- I actually hadn't even realized that IGS had gone away. Maximelene4 Nov 2017, 6:49 p.m."I had five keys that I hadn’t used yet, each for a different game purchased from IGS." Why? I mean, who buys games, and keeps the keys indefinitely, to activate them months after buying them? Smartguy4 Nov 2017, 7:30 p.m.Maximelene, learn to put two and two together. The original post mentions that purchasers get both a download link (presumably DRM free) and a key. There is no need to activate the key to play the game, but it is a legitimate part of your purchase. Judge not lest ye be judged. Van4 Nov 2017, 7:48 p.m.True I keep some keys of games I don't really feel like playing from bundles, but you have to be pretty shallow if you think it is normal for a statistically significant portion of the keys that were actually supplied to IGS ("So earlier today, I gave in and forked over some money to Kinguin for a key of my own game. Now, of course, I keep records of what keys go where. And yes, indeed, it was an IndieGameStand key") get activated after months with no good reason. Jar4 Nov 2017, 8:06 p.m.how many keys did you give in this giveaway https://www.sgda.ch/en/voucher/ Maybe this is the source and not IGS? ratsz4 Nov 2017, 8:27 p.m.I think not only devs lost money in here, was a year subscriber to their monthly program, has bought plenty of games too... And I think I lost more than 100 games (unredeemed keys). Sad story, will think twice now how I can support indie dev and resellers. Smartgirl4 Nov 2017, 9:11 p.m.It's a bunk argument. The only advantage to holding onto a key you didn't activate would be for resale. Otherwise you'd activate the key to protect your investment (while archiving your downloaded, DRM-free copy of the game). Zarkonnen4 Nov 2017, 11:59 p.m.gp - Yeah, I revoked the unsold keys. I didn't even revoke the keys that were clearly sold through Kinguin and had been activated. Jar - It was definitely the IGS keys. I can tell because I keep records of which keys I send where. mistakenot5 Nov 2017, 1:48 a.m.@Maximelene - If you buy more games than you get around to playing (which judging by talk of “Steam backlogs” is not uncommon), then waiting until you’re ready to play before redeeming a game can be useful. I’ve bought games on sale on a whim only to lose interest and gift them to someone else. In fact, just recently I gave away an unused game key that I originally bought from IGS. Nya5 Nov 2017, 3:33 a.m.Personally I have an archive of about 300+ unredeemed keys from humble bundle I use for Christmas etc. giveaways and gifts (great for games that were bundled a lot in the past, but are rarely any longer, like super meat boy or something). I would hope publishers wouldn't go around revoking them just because I use them a few years laters. Zarkonnen5 Nov 2017, 10:57 a.m.Mr Blaster: IGS did not own the keys. They were not re-sold, they were stolen. And I did not revoke any keys that were already in use. Please read the article rather than just assuming you know what happened. QuantizedBit5 Nov 2017, 8:12 p.m.Same here. Yesterday 1900 keys for VOLT http://store.steampowered.com/app/290280/Volt/ from IGS has been activated. Lambda7 Nov 2017, midnightAm I getting this right? If someone buys a key now he won't be able to activate it? If that's so why punish the customers? Shouldn't you confront IGS and gamekeyz.net about it instead of blocking customers keys? ratsz7 Nov 2017, 1:56 p.m.@Smartgirl : Not everyone sees game purchase act as an "investment". And for information, IGS didn't let you activate more than 5 keys, you had to wait hours before having access to your keys. I was not browsing IGS several times a week, so! Just don't incriminate customers. Quantized Bit8 Nov 2017, 2:40 p.m.As for Volt keys, the game is fail and I don't care to revoking anything but the thing is - IGS probably did the same with everything they had in the store and most of the devs doesn't even know that. Longshot11 Nov 2017, 3:59 p.m.It seemed to me that the store buys the keys from the developer and then sells it. And I see the developer's greed. Several dozen activations, against tens of thousands purchased in Steam - you are very greedy. 2dengine12 Nov 2017, 7:26 a.m.Sadly, I can confirm this. Had two games on the IGS store, both of them with only a handful of sales. I banned the unused keys to notice thousands of them were already activated. Wouldn’t be surprised if the keys were sold off in bulk to trading card farmers. Milkstone20 Nov 2017, 2:13 p.m.Thanks for the info, we found ~600 keys redeemed since Nov 2017 in our 2 games that were available in IGS. They have been banned now. MD BG22 Nov 2017, 10:46 p.m.Maximelene... “who buys games, and keeps the keys indefinitely, to activate them months after buying them?” Their latest PWYW deals were repeats from old deals, so loyal (haha) customers ended with quite a few copies of the same game (which were all legally purchased, mind you). Raiko1 May 2018, 5:31 p.m.How do they steal the keys? Dave26 Nov 2018, 11:43 a.m.people who run the sites are not always reputable. Their site folds and they do what they want with what's left --possibly.